What can you do with $12,215.00? Well, you could buy a new Polaris RZR ATV, a really nice bass boat, 234 shares of Verizon, or 643 bottles of Jack Daniels Old #7. Or, if you are the U.S. Army, you can buy one (1) semi-auto sniper rifle, plus some spare parts. The U.S. Army announced recently that it will replace its M110 Knights Armament-made sniper rifle with a new, lighter 7.62×51 semi-auto rifle from Heckler and Koch. 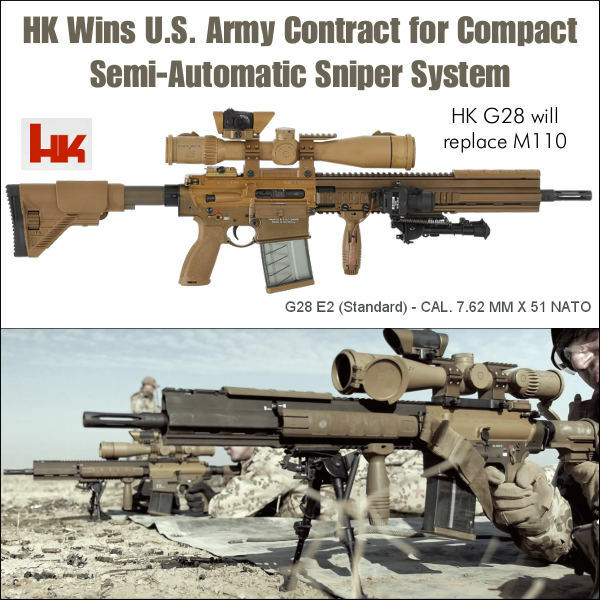 H&K will supply a slimmed-down variant of its G28 Rifle called the Compact Semi-Automatic Sniper System (CSASS). The potential max contract value is $44,500,000 for up to 3,643 rifles (and spare parts). That works out to $12,215.21 per rifle*. At that price, it better be good. Hmmm… “Not sacrifice existing performance”? We’re not sure how that can be the case. The current KAC M110 Sniper Rifle (shown below) has a 20″ barrel. 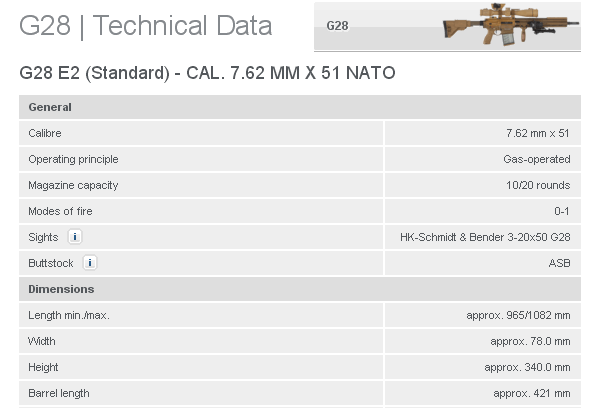 The basic G28 has 16.6″ (421 mm) barrel). Perhaps the final CSASS production version of the G28 will be fitted with a longer barrel? Comment: We’re not so sure about this deal. $12.2K is a lot of money for a souped up AR10. The KAC M110, by all accounts, has performed well in combat and has a good reputation with sniper teams. When introduced, the M110 Semi-Automatic Sniper System (SASS) won a U.S. Army award as one of the “Best 10 Inventions” of 2007. The M110 is highly acclaimed for its battlefield performance. If the military wanted a shorter rifle, it simply could have fitted a shorter barrel and a collapsible buttstock on existing M110s. That would have saved millions of dollars. But saving money is, apparently, not one of the Pentagon’s priorities these days. * This HK firearm is sold as a CSASS system. Typically, the price per system unit will include optics, attachments, fitted hard case, and spares. Share the post "Army to Buy $12,215 Sniper Rifles from Heckler & Koch"
Over the years, noted gunsmith and a Benchrest Hall-of-Fame inductee Thomas ‘Speedy’ Gonzalez has learned a few things about “tuning” rear sandbags for best performance. 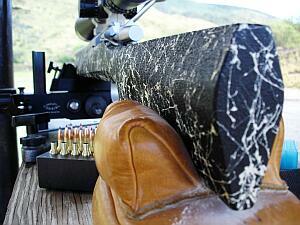 On his Facebook page, Speedy recently discussed how sand bag fill levels (hard vs. soft) can affect accuracy. Speedy says you don’t want to have both your front and rear sandbags filled up ultra-hard. One or the other bag needs to have some “give” to provide a shock-absorbing function (and prevent stock jump). Back in the old days, about the time Fred Flintstone was still alive, I worked for Pat McMillan for free, from time to time to learn all his secrets. One day little Speedy was filling some new sand bags out behind Pat’s shop, stuffing them with more sand than Taco Bell put beans in their Burritos. When Pat stepped out the back door and inquired as to what in the hell was I doing packing them there bags the way I was. You can not have two bags filled so hard that you gun bounces on them in the process of firing round at your target, especially if you have a rig with a very flexible stock. The bags must be set up in a manner for them to absorb the initial shock of the firing pin moving forward and igniting the primer. Then [they must] maintain their shape and absorb the second shock wave as well the rearward thrust and torque of the rifle. What happens to the rifle when this is not done? Well let me tell you. The rifles have a very bad tendency to jump and roll in the bags. This causes many of those wild, lost shots that one can’t explain. 1: You can not have two hard bags [i.e. both front AND rear] in your set-up. 5: We use play-ground sand, also know as silica sand. I sift mine to get any large impurities out then mix it with 25% to 50% with Harts parakeet gravel to the desired hardness that I am looking for. The bird gravel keeps the sand from packing itself into that solid as a brick state. Speaking of bricks — another thing that happens when shooters employ that heavy zircon sand is the ears form a low spot under them from recoil and then tend to rock back and forth with the rifle causing many low shots to crop up. 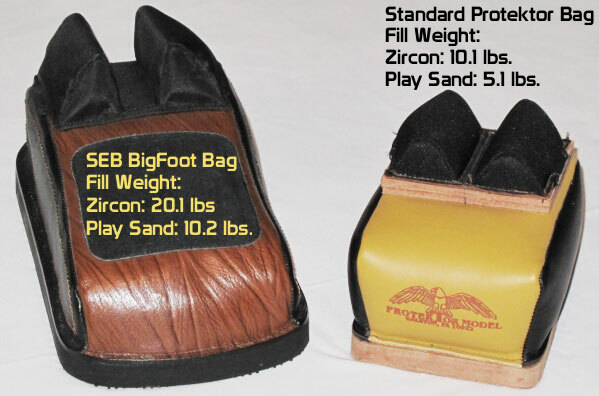 Edgewood makes an Edgewood/Speedy rear bag specially reinforced under the ears to eliminate this scenario. 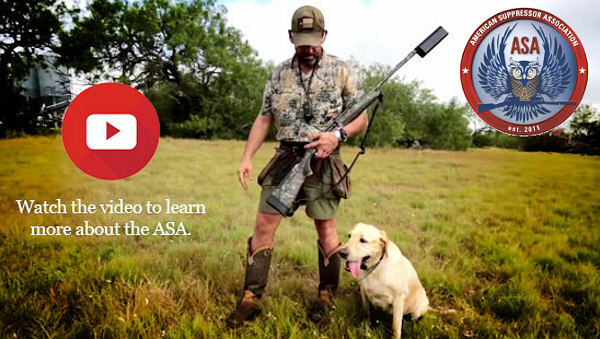 Share the post "Tuning Your Sandbag Hardness — Tech Tip by Speedy"
On Saturday, April 16, the American Suppressor Association (ASA), in partnership with Brownells, will host the Iowa Suppressor Rally, a public suppressor shoot at the Big Springs Shooting Complex near Searsboro, Iowa. 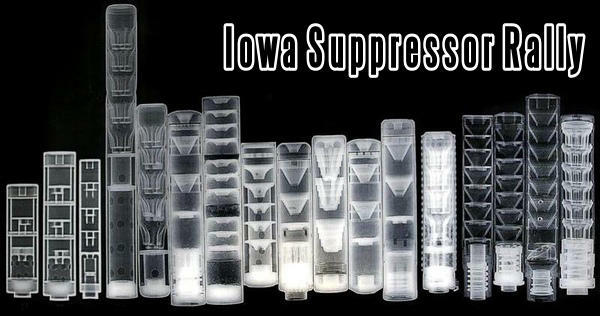 The event will celebrate the enactment of Iowa House File 2279, which legalized firearm suppressors in Iowa on March 31st. Rally organizers will provide all firearms, ammunition, and, of course, suppressors. The rally is free and open to the public. All guns and ammo will be provided at the rally; attendees are asked to leave personal firearms at home or in their vehicles. The Rally will allow Iowans to sample firearms equipped with suppressors from Advanced Armament Corporation (AAC), Dakota Silencer, Gemtech, Sig Sauer, Silencerco, and Yankee Hill Machine. 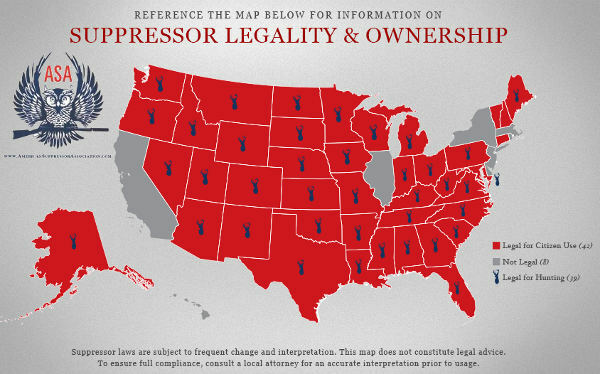 Suppressors (obtained in accordance with Federal law) are now legal to own in the vast majority of American States. CLICK HERE to learn more about obtaining a suppressor. Share the post "Celebrating Silence: The Iowa Suppressor Rally"